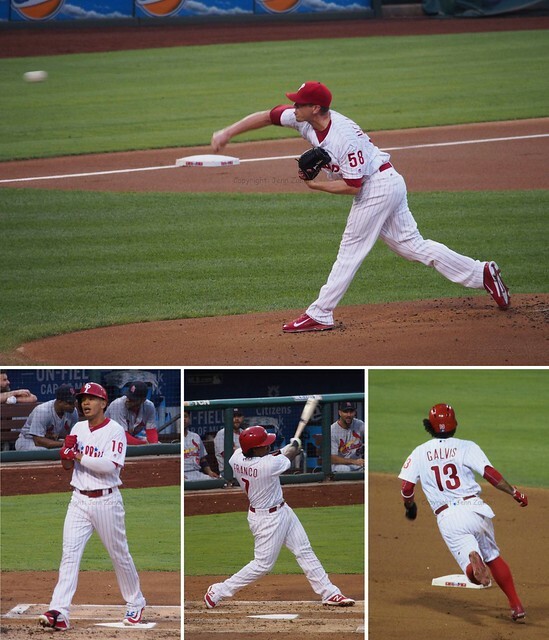 The Phillies Saturday and Sunday games this past weekend against the Cardinals were very different. Saturday started out on a great note; there were smiles, puppies, babies and Kane Kalas, paying tribute to his late Dad, Harry. The happiness continued as the game began. Jeremy Hellickson pitched well, Caesar Hernandez opened the game with a lead-off home run and the team went on to a solid 4-2 victory. And then I made the mistake of going to Sunday’s game…. Vince Velasquez was awful, as has been the case in his last 3 starts. Is it just me or should this guy be closing, not starting? He seems to be conserving energy in an effort to pitch multiple innings. As a closer, he could just let it fly for one inning. Just a thought…. Anyway, Velasquez gave up 5 runs in 6 innings, including 2 long balls. Not a good day. The offense also had a bad day with many swings and misses and confused looks on players’ faces as they failed to reach base. But no one had a worse day than Frank Herrmann (who??). This guy hadn’t pitched in the majors since 2012 with the Indians and it showed. He did have Tommy John surgery in 2013 so this outing was a great opportunity for him to show what he could do. Unfortunately, it did not go well; Herrmann lasted 2/3 of an inning and allowed 4 runs. He may want to think about how best to put his Economics degree from Harvard to better use. Other than that, it was a very sad, sloppy 0-9 loss. The Phillies lost Game 6 of the NLCS to the Giants last night, prematurely ending their season. The Giants will go on to face the Texas Rangers in the World Series while the Phils sit at home and watch. Having made it to the World Series two straight years, this loss was tough to take. The game ended, perhaps fittingly, on a Ryan Howard strike out with 2 men on base. Howard struck out 12 times in 22 at-bats and had zero RBI the entire series. This performance was a microcosm of entire Phillies playoff run where the big producers did very little. Chase Utley hit .182 with only 1 RBI; Shane Victorino batted .208 with only 2 RBI; Carlos Ruiz hit .167 with only 1 RBI…you get the picture. In last night’s game, the Phils had plenty of chances to turn things around and force a Game 7; they simply did not do it. 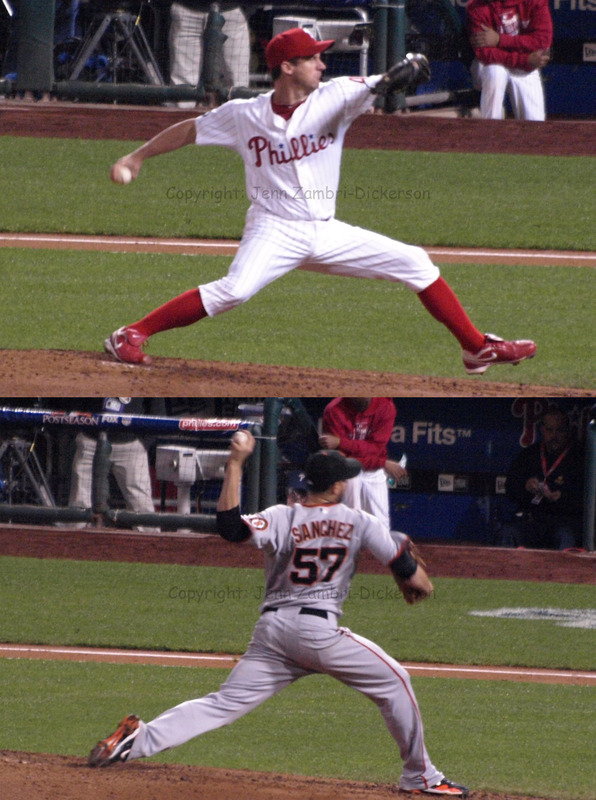 Roy Oswalt pitched a great game while Jonathan Sanchez did not. The Phillies took advantage of Sanchez early in the 1st inning; after a walk and a wild pitch, Utley doubled, Howard singled and Jayson Werth hit a sac fly. Two runs scored and it looked like the Phils were in control. Utley and Sanchez have a history; Sanchez threw at his head on 7/30/09, to which Utley said nothing. 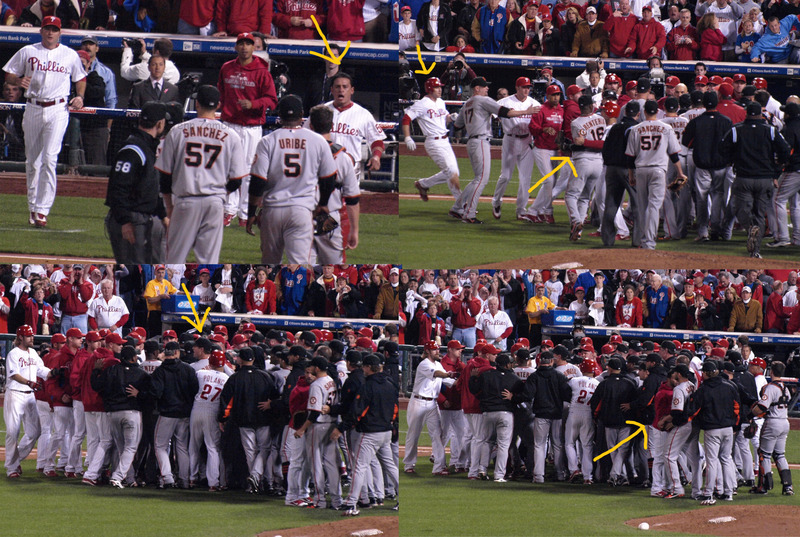 Later, Utley called time out during his at-bat and Sanchez got mad about when he called it. Utley then took him deep for a homer to right. Apparently, Sanchez has issues with Utley. Anyway, after the near-brawl on the field, Sanchez was pulled; the Phillies had two free base runners with NO outs and still failed to score. 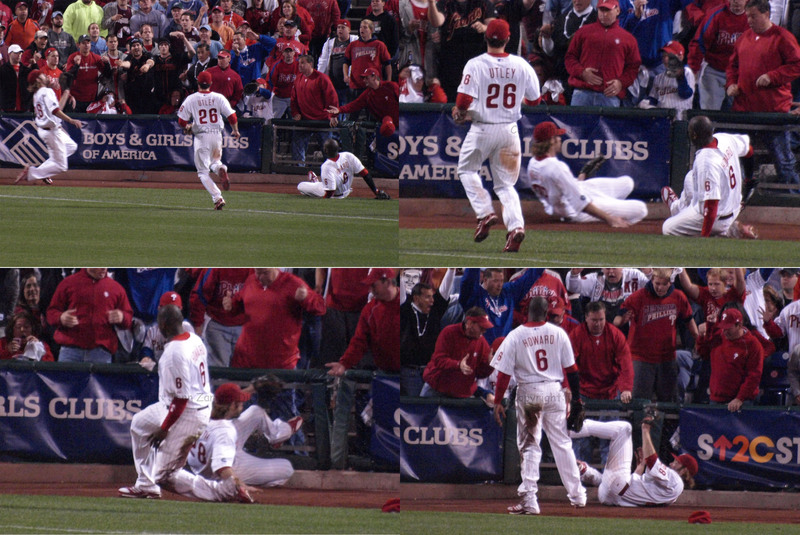 That may have been the moment that changed the entire season for the Phillies. 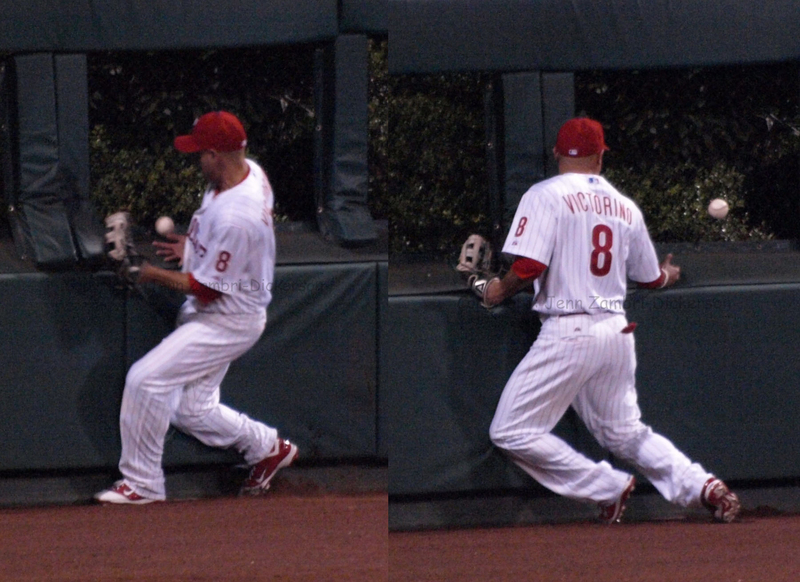 Because in the top of the inning, everything had gone wrong for the Phils defensively. Getting a run after that may have made the difference. The Phils could have escaped with just the one run scored but Polanco got a ground ball and was charged with a throwing error as Howard did not make the catch at first. Frankly, it looked like a ball he should have caught. Another run scored on the error to tie the game 2-2. It was a virtual stalemate after that for a while. The Phillies had chances to score, like in the 5th when Howard doubled but the 3rd base coach held Jimmy Rollins at third. With two outs and little offense working, he should have been sent home. In the 6th, Raul Ibanez doubled and Ruiz moved him to third with a bunt. But pinch hitter Ben Francisco went down on strikes instead of hitting a much needed sac fly. No scoring…again. In all, the Phillies left 11 men on base and went 2 for 11 with runners in scoring position. It was a lackluster effort, just like most of this series was for the Phillies. But in the 8th, forced to pitch his 2nd inning of the night, Ryan Madson gave up a solo homer to Juan Uribe which broke the tie. The Phillies could not manage a rally, down by only one run and with many base runners. They lost 3-2 and sent the Giants to the World Series. I would like to congratulate the Giants and their fans for the victory. They are a great team who fought hard and earned it. The Phillies did not play like the team we all know and that is the most disappointing part. But to have made it this far is still an accomplishment as 26 other teams did not. In the coming days, I will be analyzing the aftermath and looking ahead to what next season might bring. For today, I will quietly mourn the end of the 2010 Phillies season and try to look on the bright side later. How do you blow a 6 run lead? Just ask the Phillies. 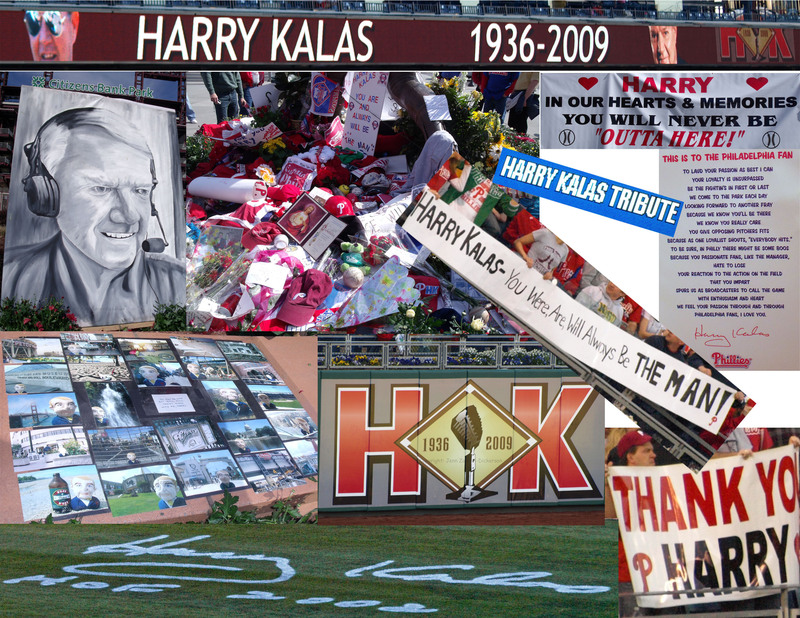 No doubt, it was an emotional day for all of us in Phillies-land, as Harry Kalas was remembered before the game and pictures and video of Harry were shown in the park between innings. His three sons threw out the first pitch and Kane Kalas sung the National Anthem. There were numerous salutes to Harry around the park, including the memorial outside the 3rd base gate at the Mike Schmidt statue. 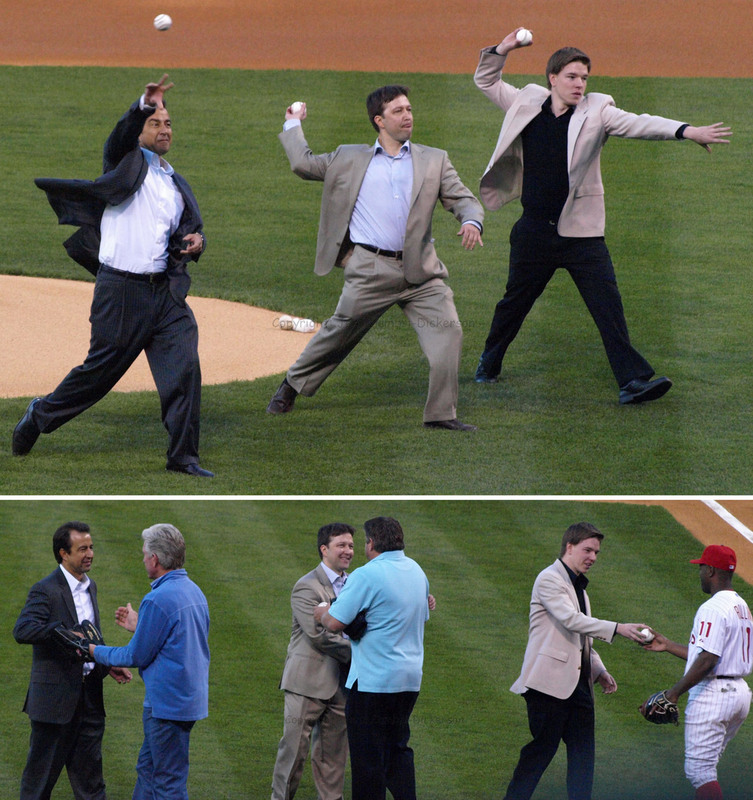 Schmidt was also in attendance at the game and caught one of the pitches from Harry’s sons as did John Kruk and Jimmy Rollins. With all the emotions flying about, it just made you wish even more that the Phillies could have pulled this one out for Harry. I suppose it was just not meant to be. The game began for me with multiple bad omens, which I happily ignored as the Phillies jumped to a 5 run lead in the first inning. I was hit in the head twice before the game even started, and not by a baseball. A man above me in the handicapped section actually dropped his 4-foot metal walking brace on my head; what he could have been doing up there to make this happen, I have NO idea. One minute, I am in my seat reading, the next minute, I am almost knocked unconscious. After I regained some semblance of lucidity, I handed the metal rod of death up to him; he said he was sorry and that was that. No one even came over to see if I was ok. Unbelievable. As I rubbed my head, now nursing a major headache, another foreign object whacked me in the back of the head, in the same spot! I looked up and saw a Comcast employee winding up one of those 1 inch thick TV cables, which is what got me the second time. This jerk did not even blink; he said nothing, pulled the cable away and left! As you may imagine, I was quite woozy at this point. I just sat there dazed and confused and, seriously, you won’t believe what happened next. Some idiot looking for his seat backed up into my row and stood on my foot while he looked around. He did not move until I lifted my leg and physically removed him from my foot! I got a very lame, “oh, sorry” as he wandered off. Clearly, this was not my day. The game finally began and the Phillies jumped off to 5 run lead with a Chase Utley 3-run homer and a Chris Coste 2-run double. Perhaps these bad omens were just some sick cosmic joke? By the 4th inning, the Phils had a 6-run lead. How could they possible blow this, especially on Harry’s day? Well, I’ll tell you how; pitching and managing. Cole Hamels began to self-destruct in the 5th inning, giving up a 2-run home run to the Padres Scott Hairston. He also allowed 2 more hits and a walk in that inning and was due to bat 2nd in the line-up. So, did Charlie Manuel remove the tiring Hamels for a pinch hitter in the bottom of the 5th? Nope. And then he sent Hamels back out for the 6th inning where, as I fully expected, he continued to give the game away; another 2-run home run, just like that. Now the score is 7-5. The offense slept through the next few innings as the pen held the Padres down, but then came the 8th inning. Ryan Madson, who based on last year, appears to be a VERY slow starter, gave up 3 runs on 3 hits and a walk, blowing the save and giving the Padres an 8-7 lead. This was a disaster and man, did my head really hurt after that. Greg Dobbs gave us a little hope as he led off the 8th with a single; Rollins bunted him over but then Shane Victorino popped out. Utley tried to play hero by whacking a single into left field, but then 3rd base coach, Sam Perlozzo, killed the rally by sending the VERY slow Dobbs home, where he was promptly tagged out. Matt Stairs ended the game in the 9th by striking out looking, but to his defense, the last 2 called strikes did not look to be anywhere near the strike zone. So besides my getting beat up at the game, another Phillies fan had a very similar day; before the game and before the Kalas boys threw their first pitch, an elderly man was invited onto the field to throw a pitch as well. 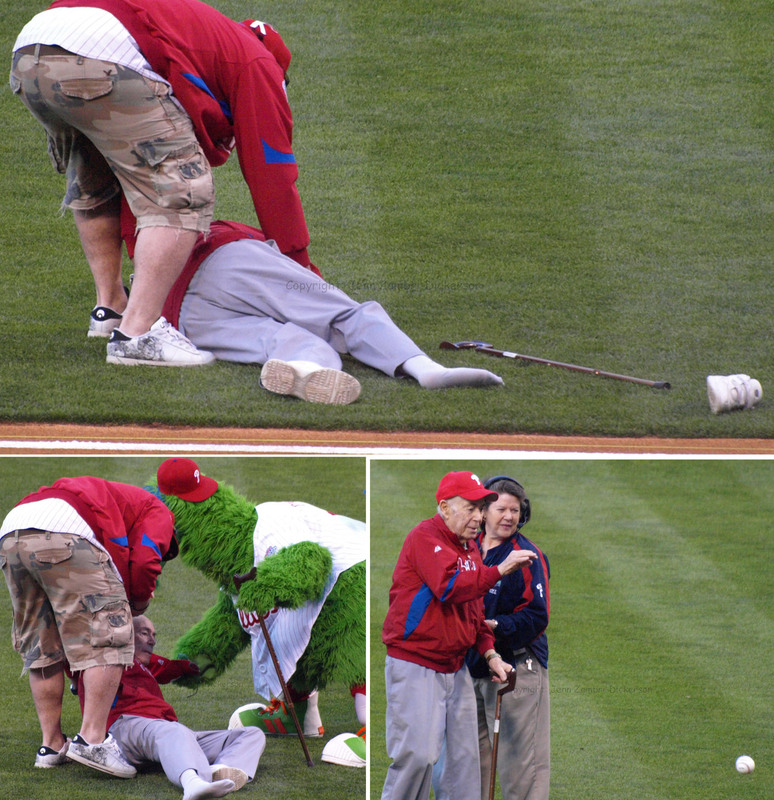 Just as the announcer told the crowd that this 82-year old man was very brave for attempting to walk out onto the field, obviously because of his health, at that exact moment, this poor guy tripped on the yellow rope the grounds crew laid down for their pre-game preparations and fell flat onto the ground, losing his shoe in the process. A very scary moment for all of us as we watched him lay there, but he was able to get up with assistance and did still throw the ball, which went about 2 feet. It was really something to see him even attempt this after such a terrible fall. Kudos to that fan for toughing it out! I do hope is okay. Sorry, I did not catch his name in all the craziness, but I wish him well. This was a very sad day for the Phillies and their fans all around. Spirits were lifted though for a while during the 7th inning stretch when all 44,984 people in attendance were invited to sing along to “High Hopes” with Harry Kalas one last time. The video played on PhanaVision as we all joined in. It was a beautiful tribute, as I am sure the memorial service will be today as well. 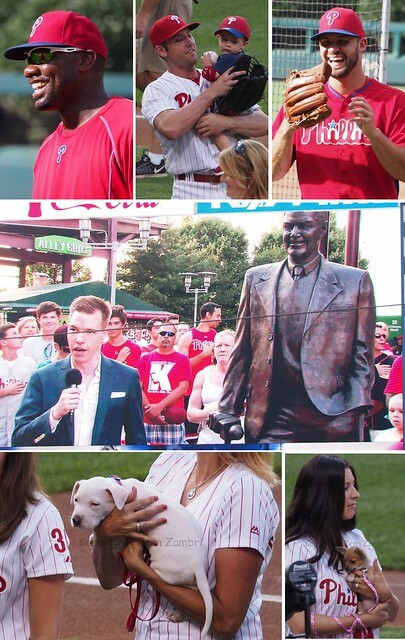 As promised, here is the photo album from the Harry Kalas tribute on Friday and the game. There are two pictures that I think you should all see; Jimmy Rollins was holding Harry’s favorite white shoes and Chase Utley held his blue jacket while Kane Kalas sung the National Anthem. I think those shots really sum up the week. *Read more about the Phillies at MY OTHER HOME PAGE! Phillies Phollowers has joined forces with Phightin’ Phils Phorum! Remember also to check out the homepage, My Team Rivals and my very own Miami Dolphins page, The Dolphin Pod!